Despite the apparent pessimism of the audience, thanks to machine learning today anyone with a little bit of Python knowledge and a large enough dataset can take a stab at writing a sci-fi drama worthy program. How to use NVIDIA's DALI library for highly optimized pre-processing of images on the GPU and feeding them into a deep learning model. You will also have your very own Generative Adversarial Network set up to be trained on a dataset of your choice. Without further ado, let's dig in! At the heart of any machine learning project, lies the data. Unfortunately, Scaleway cannot provide the CMU Multi-PIE Face Database that we used for training due to copyright, so we shall proceed assuming you already have a dataset that you would like to train your model on. In order to make use of NVIDIA Data Loading Library (DALI), the images should be in JPEG format. The dimensions of the images do not matter, since we have DALI to resize all the inputs to the input size required by our network (128 x 128 pixels), but a 1:1 ratio is desirable to obtain the most realistic synthesised images. The advantage of using DALI over, e.g., a standard PyTorch Dataset, is that whatever pre-processing (resizing, cropping, etc) is necessary, is performed on the GPU rather than the CPU, after which pre-processed images on the GPU are fed straight into the neural network. 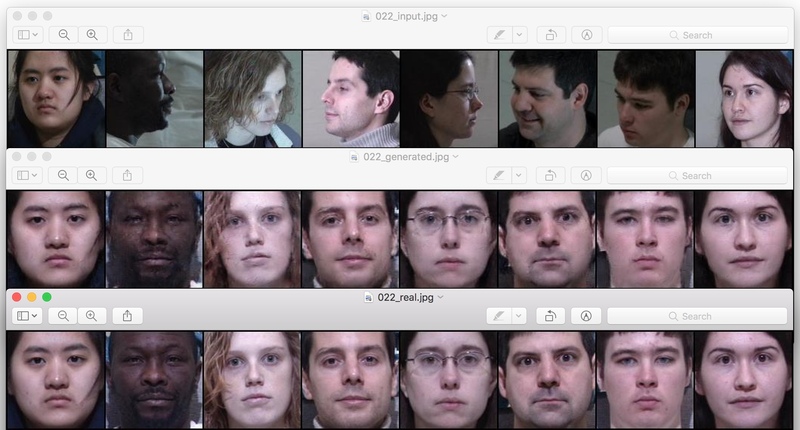 For the face frontalization project, we set up our dataset in the following way: the dataset folder contains a subfolder and a target frontal image for each person (aka subject). In principle, the names of the subfolders and the target images do not have to be identical (as they are in the Figure below), but if we are to separately sort all the subfolders and all the targets alphanumerically, the ones corresponding to the same subject must appear at the same position on the two lists of names. As you can see, subfolder 001/ corresponding to subject 001 contains images of the person pictured in 001.jpg - these are closely cropped images of the face under different poses, lighting conditions, and varying face expressions. For the purposes of face frontalization, it is crucial to have the frontal images aligned as close to one another as possible, whereas the other (profile) images have a little bit more leeway. For instance, our target frontal images are all squares and cropped in such a way that the bottom of the person's chin is located at the bottom of the image, and the centred point between the inner corners of the eyes is situated at 0.8h above and 0.5h to the right of the lower left corner (h being the image's height). 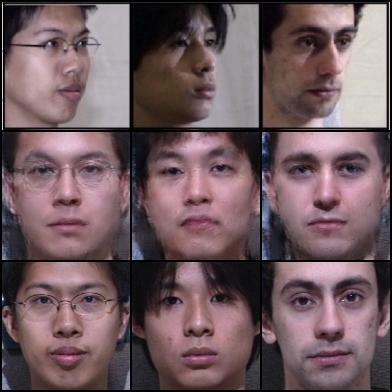 This way, once the images are resized to 128 x 128, the face features all appear at more or less the same locations on the images in the training set, and the network can learn to generate the said features and combine them together into realistic synthetic faces. We are now going to build a pipeline for our dataset that is going to inherit from nvidia.dali.pipeline.Pipeline. At the time of writing, DALI does not directly support reading (image, image) pairs from a directory, so we will be making use of nvidia.dali.ops.ExternalSource() to pass the inputs and the targets to the pipeline. You can now use the ImagePipeline class that you wrote above to load images from your dataset directory, one batch at a time. Here we start with input that is 128x128 and has 3 channels. As we pass it through convolutional layers, the size of the input gets smaller and smaller (from 128x128 to 64x64 to 16x16 etc on the Figure above) whereas the number of channels grows (from 3 to 8 to 16 and so on). This reflects the fact that the deeper the convolutional layer, the more abstract are the features that it learns. In the end we get to a layer whose output is sized 1x1, yet has a very high number of channels: 256 in the example depicted above (or 512 in our own network). 256x1 and 1x256 are really the same thing, if you think about it, so another way to put it is that the output of the Encoder is 256 dimensional (with a single channel), so we have reduced the dimensionality of the original input from 49152 to 256! Why would we want to do that? Having this lower dimensional representation helps us prevent overfitting our final model to the training set. In the end, what we want is a representation (and hence, a model) that is precise enough to fit the training data well, yet does not overfit - meaning, that it can be generalised to the data it has not seen before as well. # At this point, we arrive at our low D representation vector, which is 512 dimensional. Generative Adversarial Networks (GANs) are a very exciting deep learning development, which was introduced in a 2014 paper by Ian Goodfellow and collaborators. Without getting into too much detail, here is the idea behind GANs: there are two networks, a generator (perhaps our name choice for the Encoder/Decoder net above makes more sense now) and a discriminator. The Generator's job is to generate synthetic images, but what is the Discriminator to do? The Discriminator is supposed to tell the difference between the real images and the fake ones that were synthesised by the Generator. Usually, GAN training is carried out in an unsupervised manner. There is an unlabelled dataset of, say, images in a specific domain. The generator will generate some image given random noise as input. The discriminator is then trained to recognise the images from the dataset as real and the output of the generator as fake. As far as the discriminator is concerned, the two categories comprise a labelled dataset. If this sounds like a binary classification problem to you, you won't be surprised to hear that the loss function is the binary cross entropy. The task of the generator is to fool the discriminator. Here is how that is done: first, the generator gives its output to the discriminator. Naturally, that output depends on what the generator's trainable parameters are. The discriminator is not being trained at this point, rather it is used for inference. Instead, it is the generator's weights that are updated in a way that gets the discriminator to accept (as in, label as "real") the synthesised outputs. The updating of the generator's and the discriminator's weights is done alternatively - once each for every batch, as you will see later when we discuss training our model. Since we are not trying to simply generate faces, the architecture of our Generator is a little different from the one described above (for one thing, it takes real images as inputs, not some random noise, and tries to incorporate certain features of those inputs in its outputs). Our loss function won't be just the cross-entropy either: we have to add an additional component that compares the generator's outputs to the target ones. This could be, for instance, a pixelwise mean square error, or a mean absolute error. These matters are going to be addressed in the Training section of this tutorial. As you can see, the architecture of the Discriminator is rather similar to that of the Generator, except that it seems to contain only the Encoder part of the latter. Indeed, the goal of the Discriminator is not to output an image, so there is no need for something like a Decoder. Instead, the Discriminator contains layers that process an input image (much like an Encoder would), with the goal of distinguishing real images from the synthetic ones. DALI is a wonderful tool that not only pre-processes images on the fly, but also provides plugins for several popular machine learning frameworks, including PyTorch. If you used PyTorch before, you may be familiar with its torch.utils.data.Dataset and torch.utils.data.DataLoader classes meant to ease the pre-processing and loading of the data. When using DALI, we combine the aforementioned nvidia.dali.pipeline.Pipeline with nvidia.dali.plugin.pytorch.DALIGenericIterator in order to accomplish the task. # Where is your training dataset at? Now you are ready to train. Mathematically, training a neural network refers to updating its weights in a way that minimises the loss function. There are multiple choices to be made here, the most crucial, perhaps, being the form of the loss function. We have already touched upon it in our discussion of GANs in Step 3, so we know that we need the binary cross entropy loss for the discriminator, whose job is to classify the images as either real or fake. However, we also want a pixelwise loss function that will get the generated outputs to not only look like frontal images of people in general, but the right people - same ones that we see in the input profile images. The common ones to use are the so-called L1 loss and L2 loss: you might know them under the names of Mean Absolute Error and Mean Squared Error respectively. In the code below, we'll give you both (in addition to the cross entropy), together with a way to vary the relative importance you place on each of the three. In the figure above, the upper row are some of the inputs fed into our model during the 22nd training epoch, below are the frontal images generated by our GAN, and at the bottom is the row of the corresponding ground truth images. Next, lets see how the model performs on data that it has never seen before. Here we have trained the GAN model with parameters as in the code above for the first three epochs, then set the GAN_factor to zero and continued to train only the generator, optimizing the L1 and L2 losses, for two more epochs. Why use GANs for supervised ML problems? Generative Adversarial Networks were initially meant for unsupervised machine learning: a typical training set consists of the so-called "real" examples of some data (which are not labeled, unlike in supervised learning), and the goal is to train the network to generate more examples of the same sort of data. However, GANs are increasingly being used for tasks where training inputs have corresponding outputs (i.e., supervised machine learning). Examples include face frontalization, super resolution, etc. What is the benefit of introducing a GAN architecture into such problems? Let us compare the results of training the Generator network above in a supervised way using only the L2 pixelwise loss, with the combined Generator/Discriminator architecture. In the latter case, the Discriminator is trained to accept the real images, reject the synethic ones, and the Generator learns to fool the Discriminator in addition to optimizing its own L2 loss. While our training set does not have enough unique GT frontal images to train an unsupervised GAN with the likes of NVIDIA's Style GAN, the GAN architecture turns out to be very good at generating the above-mentioned fine features, even though it introduces unwanted noise elsewhere. Evidently, these are the details that the discriminator uses to distinguish the real images from the fake ones, facilitating the generation of photorealistic and super-resolved synethic outputs.